Preheat the oven to 190°C, gas mark 5. Place the dates in a small pan with the vanilla extract and 150ml cold water. Bring to the boil, cover then simmer gently for 5 minutes. Use a hand-held blender to process the cooled dates, water and vanilla extract until smooth. Pour into a bowl then stir in the syrup, egg yolks, flour and sultanas. Whisk the egg whites until stiff peaks form then gently fold in to the date mixture. 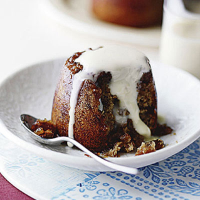 Place a spoonful of maple syrup into 6 x 150ml non-stick dariole moulds or pudding bowls. Spoon in the sponge mixture then top with a circle of greaseproof paper. Cover the top of each mould firmly with a square of pleated foil. Place the puddings in a roasting tin and pour in boiling water to reach halfway up the sides of the moulds. Bake for 45-55 minutes, topping up with boiling water if necessary, until the puddings are risen and firm. Remove the foil and greaseproof paper then turn the puddings out onto small plates. Serve hot with Waitrose Perfectly Balanced Vanilla Custard. To microwave, spoon the sponge mixture into suitable moulds (teacups work well) and microwave for 2-3 minutes, depending on your oven. Leave to stand for 1 minute before turning out.